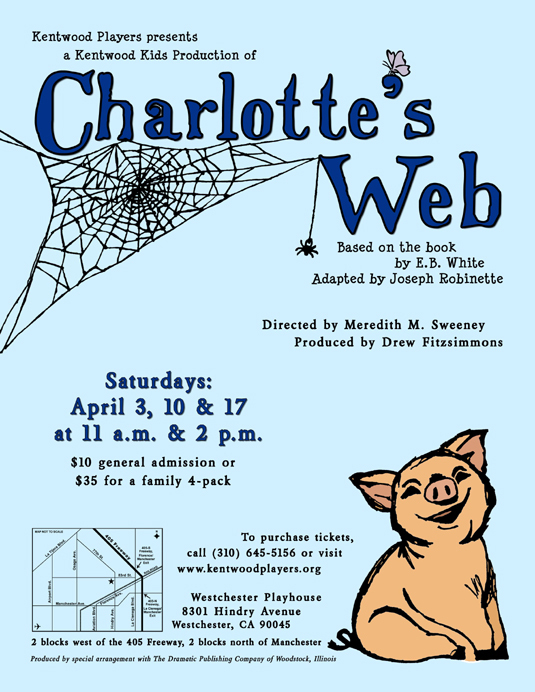 Charlotte weaves a very special web to help save her new friend, Wilbur. (clockwise from top: Petra Schaaf-Grisham, Courtney Vanden Eikhof and Martina Povolo). Wilbur (Martina Povolo) and Charlotte (Petra Schaaf-Grisham) quickly become good friends on Zuckerman’s farm. Fern (Courtney Vanden Eikhof) is the first person to see that Wilbur (Martina Povolo) is really "Some Pig". Wilbur and Fern team up to teach Avery an important lesson (Martina Povolo, Logan Hannig, Courtney Vanden Eikhof). Edith is skeptical but Homer can not say no to his niece, Fern and her new pig, Wilbur (Susan Weisbarth, Jordan Bland, Martina Povolo, Courtney Vanden Eikhof). Wilbur is surrounded by his good friends Charlotte and Fern. They are joined by Templeton, Avery and the Zuckermans (clockwise from top: Jordan Bland, Susan Weisbarth, Logan Hannig, Courtney Vanden Eikhof, Martina Povolo, Petra Schaaf-Grisham, Brooklynn Davidson). Homer and Edith Zuckerman (Jordan Bland and Susan Weisbarth) own the farm where Wilbur and Charlotte live.